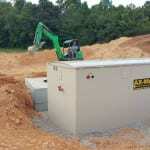 Our septic engineering services begin with expert design of your septic system in Brandon. At Southern Water and Soil, we are ready to assist you with expert septic engineering at your home or business in Brandon, Florida. With over 30 years of combined experience in the residential and commercial septic industry, we are confident that you’ll achieve the best results when you work with our team on your septic system needs. Our septic engineering services begin with expert design of your septic system, including providing septic and drain field options that will suit your property best. We know that not every property is well-suited for a traditional septic system, and we provide the alternatives you need to get cost-effective, long-term use from your system each year. Once our septic design is complete, we’ll also provide the installation and maintenance solutions you need at your home or business. The only way septic engineering provides long-term results is if the installation and maintenance processes are completed as required. At Southern Water and Soil, we are committed to exceeding customer expectations and will keep you informed throughout the process, so you feel confident your septic system will meet your needs. When you rely on our skilled team at Southern Water and Soil for septic engineering, you will never have doubts that you will need septic services again too soon. Contact us today if you are looking for septic solutions, require new septic engineering and installation, or need repair and maintenance services in Brandon. Our comprehensive services will help you achieve the most from your septic system. We look forward to working with you.